Silence has its origin in an over-door panel Redon painted in 1911 for the library of his friend Gustave Fayet in the eleventh-century Cistercian Abbaye de Fontroide in southern France. The work invites the viewer to be calm and serene as befits a library and an abbey, while also suggesting the mysterious, dream-like quality that characterizes Redon’s work. 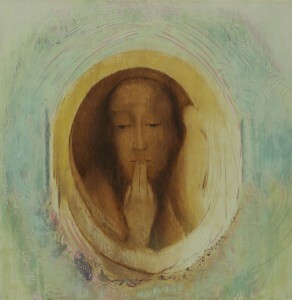 Redon’s inspiration for the image was likely Le Silence, the famous 1842 marble relief by Auguste Préault on tomb of Jacob Roblès in the Père Lachaise Cemetery in Paris, which has the same figure holding his fingers pressed to closed lips situated within a roundel with floral decoration. The gesture of pressing fingers to lips suggests that of the Greek god Harpocrates, the god of silence and secrecy, and is often interpreted as an exhortation to silence in the face of subjects that exceed human understanding. In Redon’s painting the figure’s left hand, barely indicated, touches his left earlobe in a gesture that suggests listening closely for quiet sounds. The American collector Lillie P. Bliss purchased this painting from the Armory Show for $540 and gave it to the Museum of Modern Art in 1934. It was one of several purchases she made at the exhibition; she also bought Redon’s pastel Roger and Angelica (c. 1910, Museum of Modern Art, New York) and several of his prints, as well as prints by Paul Cézanne, Maurice Denis, Paul Gauguin, Pierre-Auguste Renoir, and Edouard Vuillard. See “Redon at the Abbaye de Fontroide,” available on-line at www.musee-orsay.fr. See the entry for this work in Odilon Redon: Prince du Rêve, 1840-1916, Rodolphe Rapetti, ed., (Paris: Réunuion des Musées Nationales, 2011), 392.